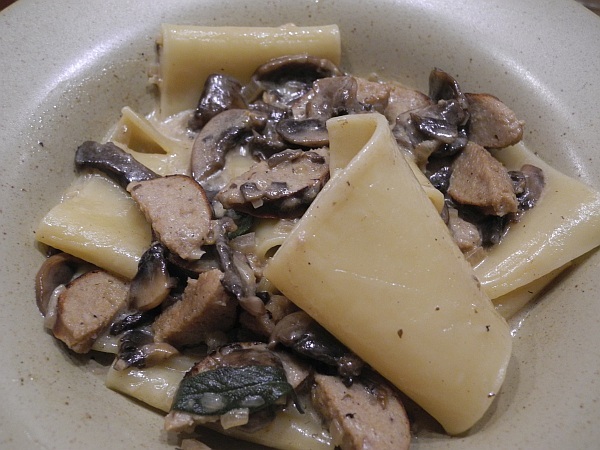 We needed to use up some white mushrooms, and I suggested trying my boudin blanc pasta with these instead of the usual eryngii and hen-of-the-woods (maitake). I had bought cream for [what turns out to be] tomorrow’s “poblano quiche” so had some extra to use up, and it all fit together. I really didn’t think this version came close to the original, so will return to eryngii and maitake mushrooms [best sub: oyster mushrooms] whenever possible (which is almost always). Threads that come together: 1) Cook Christopher Lee’s boudin blanc sausage in butter, 6 minutes on a side. 2) Cook chopped shallot in butter, add mushrooms [this time, I had to cook them past the “giving up liquid” stage through to the “taking the liquid up again” stage]. When done, add the cooked sausage, 1/4 cup cream, and 1/4 cup white wine, and some sage leaves (this time, just over a dozen small ones). 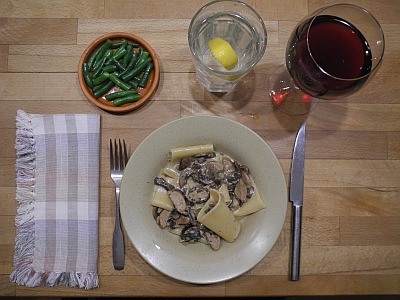 3) Cook 2 servings pasta will al dente – in this case, paccheri, 12 minutes. I cooked 4 oz of pasta, and I think actually 5 would have been slightly preferable. Use the pasta water to heat bowls. I also cooked the rest of the green beans – really nice ones! from the Bowl – steamed 4+ (missed the timer) minutes, then reheated in butter, and salted. 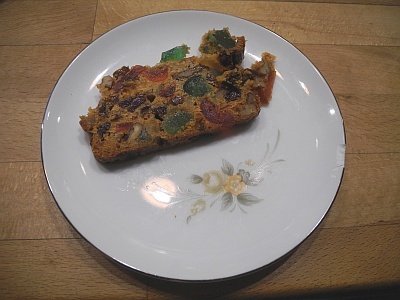 Later, I had a slice of fruitcake, even though [for some reason] D didn’t want dessert. 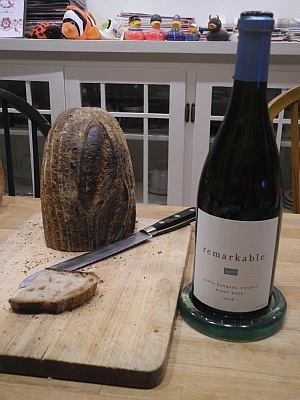 This entry was posted in Mushrooms, Pasta, Sausage, Uncategorized and tagged Cream, Dessert-Sweet, fruitcake, Green beans, Grocery Outlet, Mushrooms, Pasta, Pinot Noir, Sage, Sausage. Bookmark the permalink.